Projective test is a personality test which is conducted in psychology. This test is done in order to understand the stimuli of the person. Besides this, the test also reveals different types of hidden emotions of a person – it also helps you to understand the internal conflicts of a person. This is also known as the objective test or a self-report test. The responses received from this test are properly analyzed by the experts – the presumptions are analyzed on the basis of a universal standard. The projective tests are done under the assumption that humans have conscious and unconscious motivation and attitudes. The test affirms that an individual has various needs which can be both conscious and unconscious. These needs can be understood using the projective tests. It is very common to think that these projective tests can be more on the sides of personality. And that is why it mainly handles all the factors of a natural human behavior on conscious and unconscious elements. The need of the person comes out spontaneously and there is no editing in these needs. It is the actual picture about the thought process of a person. And that is why these projective tests represent most spontaneous outcomes of a human behavior. Moreover, it clearly pictures all the needs and wants of the person in middle of some sort of emotional roller coaster rides. The test does not depend on the verbal details of the person who is getting tested. The results are confirmed on the basis of what the person tells spontaneously while conducting the tests. In simpler words, one can definitely understand the actual personal behavior. Therefore, it is one of the most non-verbal communication where in which people present their nonverbal communication and that might depend upon behavior, reaction and attitude. This study understands all the results of personality reactions. And most importantly, all the motivations, beliefs and attitudes are detectable quickly. And that is why bringing motivational barriers can increase the stake of this projective test hypothesis high. There are various types of projective tests which are carried out on the individuals depending upon the needs of the person. The Rorschach inkblot test is very frequently used by the experts for the purpose of projective tests. In this test there are various ink blots which are plotted symmetrically, but in an irregular position. The person is then asked what they are seeing in these blots. They get various responses from this test – the response is then analyzed keeping in mind various parameters. The experts check what time was taken to respond, what the person said about the ink blots, which was the most important aspect that was touched upon. If the respondent sees fearful images, then they assume that the person is suffering from paranoia. The Holtzman test is a variation of the Rorschach test. Here the images used for the respondent is much more as compared to the above test. The major difference between the two tests is that in this particular test the objective scoring is more important – the experts actually check the reaction time of the individual during the inkblot test. This test is another well-known test – it is more popularly known as the TAT test. In this type of test the individual is asked to look at various scenes which are ambiguous. The respondent is given time to analyze the scenes and also to understand different aspects of the picture or scene. The respondent will be asked to provide information about what type of a picture is shown – what are the characters present; what are the emotions present in these characters or you can also ask what will happen further. The experts check these responses and come to a conclusion and thus understand the frame of mind of the person. It has been proved by various studies that handwriting of a person can reveal many things. Graphology is a skill of handwriting through which the experts can understand your nature and physical characteristics. When the respondents write, the experts can easily understand the state of mind in which the person is at present; besides this they can also analyze the personality traits of the person. Even though there have been many controversies about graphology it is still used for projective tests and they have positive results. This test as the name suggests needs the respondent to complete certain sentences. This has to be done in their own words – when the respondent completes the sentences it reveals the conscious and unconscious attitudes of the person, beliefs and motivation. The person could be in any state of mind while completing the sentences – this will show in this test – thus providing the expertise to evaluate the nature and state of mind of the person. As per the examiner, it is the image that helps you understand the psychological condition of the person who had undergone the test. But as this test is also considered one which lacks validity, many disagree to the point of psychological tendencies and instead believe that the person has poor drawing skills. This test was developed by John Buck and it comprises of a set of 60 questions to ask the respondent. The test interpreter can also add some of his questions during the test. In this house-tree-person, the candidate is said to draw a picture of a house,tree and a person. After completion of the drawing, the examiner asks few questions to the respondent and they analyze the answers given. Who visits the person who lives here? Though these projective tests are developed for understanding human behavior and emotions, not many people completely agree with its outcomes. Despite the fact that there are many kind of limitations to these projective tests, they are still used by many psychiatrists and psychologists. Also many experts who work on these projective tests are working on updating these tests such that they not only provide validity but also add some value. Projective tests are also been used in market research to evaluate the emotions, associations, and thought processes related to the brand and products. Projective techniques are mainly designed and developed for making use in the psychology sector, especially when conducting psychological tests. These tests are conducted mainly to evaluate and analyze the person’s emotions and other feeling through test interviews. The primary purpose of projective tests is to measure and evaluate ones individual personality. The results which are obtained as the outcome of the tests are helpful in understanding the strengths, weakness and other emotions and also improving the personality traits. The top known projective psychological test are the Rorschach, or inkblot tests. Projective tests have created many debates and controversies among the experts – because at times the results may vary as compared to the personality of the person. But the fact is that these tests have proved to be positive to a large extent. There are many persons who have been benefitted because of this test. The experts have been able to help the person change their behavior and take a positive attitude in their lives. While conducting the projective tests, there are many assumptions which can be taken into consideration. Most of the time these types of tests create some sort of situation where in which the personality of the person is pictured in a very unstructured manner. And that is why it can be considered as an advantage for the people who undergo such type of tests. Since they can present their personality in a very common and simple way. Therefore, it is necessary to understand the concept of projective tests before coming to a final conclusion. Sometimes it happens that people undergo some sort of different characters. And those characters can confuse them completely. To make things clear projection test conducts some sort of personality study segment. This personality study segment helps people understand the actual objective of these projection tests. Therefore, it is an assumption that projection test is greater than stimulus in terms of their visible constraints. Most commonly during any type tests or examination, the result will depend on the reaction and refection of the a human behavior. And fortunately these projections tests created a diversion where in which all the test results of the respondent are considered as one of the benefits for their own purpose. Therefore, these projection tests help a respondent understand all the facts and benefits of these tests. Because of these projective tests the person is not aware about what they are disclosing during the projective tests. And it can be considered as one of the major benefits for all the respondents. The age of the examiner or the expert is also considered while conducting of the projective test; there are specific instructions and clues which are provided during such tests. Therefore, all the additional benefits of projection tests can understand common human behavior. These additional benefits about projective tests can be more beneficial for all the readers as they explore new area of working with projective tests. And they are as follows. 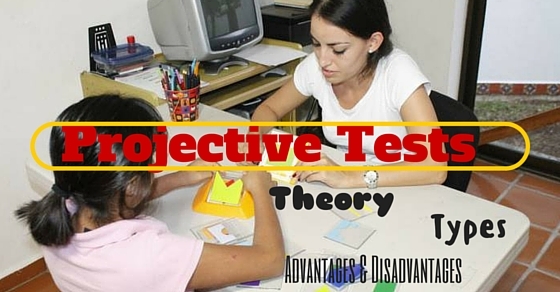 The projective or objective tests are used in marketing research extensively. The projective tests are used in qualitative marketing research – it helps to identify the potential customers and associations. The test helps to bifurcate between the brands and also the emotions which provoke the brands. The benefit of using in advertisements is that the companies can know the responses of their products and services from their customers. The application of the projective tests is done for various psychological responses and researches – the responses are received from multiple sources other than single sources. It is important for any business to conquer the market and in order to do this they should have a correct assessment about their customers. These techniques are used for the assessment about different variants of the TAT test – it includes the behavioral interview and various other approaches. The projective test helps the business to understand about the customers and their requirements. According to these responses the business can easily conquer the market and face the competition. There is some possibility that while studying or researching about these projective tests, a person can undergo some sorts of disadvantages which can completely change the outlook of the tests. And it is very common to explore the advantages and disadvantages of some techniques and tests that are in the process of an investigation. All the terms and elements used in these projective tests requires high maintenance. And it is even possible that under these quite high maintenance the respondent can be intimidated. Therefore, it is a factual information that those who conduct such projective tests need to be well qualified and experienced in this field of study. And finding such highly qualified and experienced interviewers can be an added disadvantage. These projective tests are one of the major interviewing and researching technique and that is why it costs a bit more than any other tests and researches. The projective tests are conducted to identify all the personality, attitude and human behavior. Therefore, it is necessary to understand all the external factors of these projective techniques in terms of their cost and results. These risks of interpretive bias can be considered as one of the common and highly effective disadvantages of these projective tests. The structural outcome of these interpretive bias can be measured in terms of their projection. As all the facts about projective tests evolves around personality change and behavior, there is quite a possibility that the interpretation of those personalities can be interpreted in a completely different manner. The people who undergo these unusual behaviors during these projective tests can be in the high side of the risk. And that is why all the situations and facts about the projective techniques and tests can fortunately be in a comforting side of engaging in unusual behavior. Therefore, projective tests are one of the way where in which all the personality change and reaction over situation counted the most. As it is explained earlier that projective tests mainly revolve around an interviewing procedure which takes a command from an unstructured techniques. And this unstructured technique can change the complete game eventually. While processing these tests one can understand all the unplanned and unexpected situations. And it is quite possible that at the end one can clearly come out of such unstructured techniques. Finally, the bottom line is that all the above mentioned meaning, advantages and disadvantages of projective tests can provide clear clarification about their detailed information. There are some people who might get confused about the elements mentioned in the discussion, but this discussion over projective tests can clear all types of confusion among people. Therefore, if anyone interested to know more about the projective tests, then they can read all the information stated above in favor of projective tests.